New technology and medical equipment has revolutionized healthcare over the years by improving the quality of care and the way in which diseases are both detected and cured. The advancement of medical equipment doesn’t seem to be slowing down, in fact, it seems to be accelerating. For starters, medical information can be accessed a lot easier than ever before. While there are some concerns about HIPAA regulations as it relates to the privacy of a patient’s medical history, there are many benefits to being able to easily access patient information. It some cases, it can increase the speed in which a doctor is able to pinpoint an issue and find the proper solution for their patient. They are also able to run and request the results of tests much faster than in years past. There’s also access to medical information by patients who are able to go online and research different conditions in order to better understand their diagnosis. There was a time when you had to pretty much rely on the information provided by your doctor, but that is no longer the case. In instances when your doctor is not immediately available, you can conduct an online search to find general information to alleviate the angst that’s often associated with a medical diagnosis. Just keep in mind that there are some dangers to finding information online because sometimes it can cause unnecessary worry instead of making you feel better about what’s on the horizon. The same applies when medical attention is required for pets by a veterinarian. There is a lot of information online that can be accessed in order to help you better understand what’s going on with your pet. However, it’s usually necessary to visit a clinic with access to veterinary anesthesia systems depending on the seriousness of your pet’s health issue. 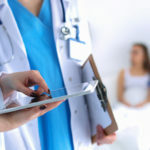 A surprising aspect of how technology is used in healthcare is the fact that doctors, clinics and hospitals have a presence on different social media platforms where they engage with the general public to provide helpful information. The education provided can be very useful and it can also help patients find a doctor that fits their individual needs. It’s not like years before when you had a limited number of doctors from which to choose. A wide variety of medical equipment and online resources often results in better overall treatment and improved wellness. Even people who live in remote locations of the world, but have access to the internet, can improve their health by leveraging information provided electronically. This includes what they can find over the internet and through various apps accessed from Smartphones. There are even medical devices that are portable and can be used by patients in their homes. Now that technology has advanced, plastic surgery is more commonplace because it has reduced the costs. Not only is it more common, but also the speed at which someone can obtain plastic surgery has accelerated due to technological advancements. Whether medical services provided are for cosmetic purposes or to save lives, technology has simplified the process.